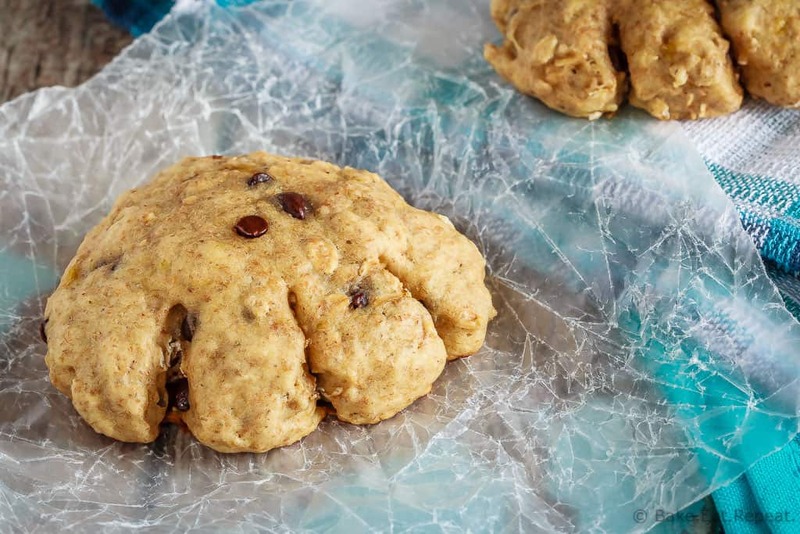 Super soft banana bread bear paws that are made with whole grains and are much healthier than the store-bought ones. Plus, the kids love ’em! I have a healthy cookie for you today! Basically, it’s banana bread in the form of a super soft, almost cake-like cookie. And shaped like bear paws. Because my kids incessantly ask for those bear paw cookies every. single. time. we see them at the store. And I get sick of saying no. So I made them some bear paws. It’s not like I never buy snacks at the store. Let’s be honest, it’s awfully convenient and easy, and some of that stuff is just plain tasty. But cookies? I hate to buy cookies. I make so many of them anyways, and I like doing it, so why buy them? They’re rarely better than homemade ones anyways. Except oreos. I will always make an exception for oreos. Some things just can’t be duplicated exactly. It’s true. I’ve tried. Homemade oreos are good, but they’re not the same. Anyways – bear paws. Now I’ll be honest, I’ve never actually had a bear paw cookie. Cake-like cookies just aren’t my thing. But the kiddos like them, and have had them, and they told me these were pretty close. In fact, when I made them a second time so I could get some pictures, my 7 year old ran over and hugged me he was so happy. Either that means they’re amazing, or I don’t make things more than once often enough. I’m going with the former! At any rate, I think I can say that these are close to the banana bread bear paws you get at the store. 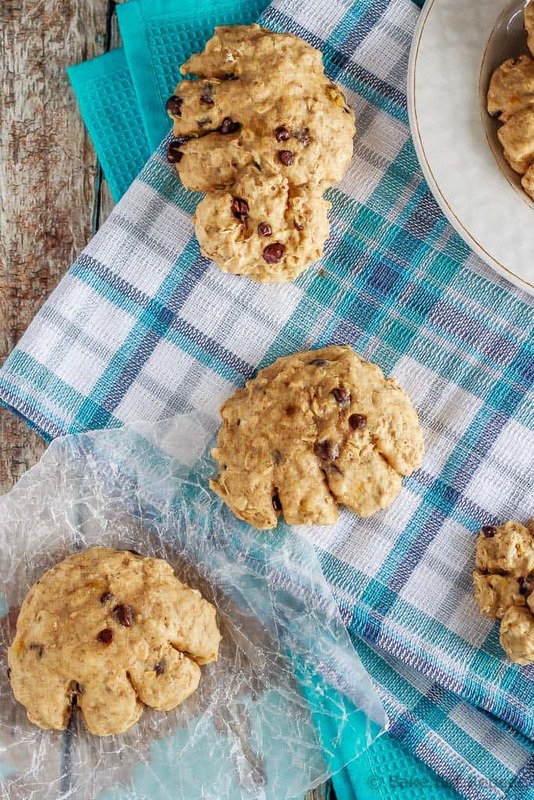 They’re soft, cakey, banana bread cookies that are definitely healthier than the store-bought ones. They’re still cookies, so there is butter and sugar in them, but there’s a whole lot less than a regular cookie has, so that’s a win. Plus these are made with whole wheat flour and oatmeal. They are quite large, I used a 3 tablespoon cookie scoop to make giant bear paws, and then scooped about half a tablespoon of dough to make mini bear paws. You could certainly play with the amounts of dough used to make them the size you would like, just watch the baking time then. We added a few chocolate chips, cause everything is better with chocolate, but you could certainly leave them out if you want them to be healthier. These were a great snack for the kids, and the perfect addition to their lunch boxes. And, even though my “bear paw” shaping wasn’t amazing, they were just happy that they got the banana bread bear paws they’d been wanting for so long! I’m going to have to work on the other flavours now! I also shared this banana bread bear paws recipe over on Food Fanatic. Thanks for the recipe it's a perfect pairing to the original melasses version I already make regularly. I took a picture for you but can't seem to post it. Thank you so much for this receipe. My kids LOVE Bear Paws, but I have refused to buy them for the past year because they contain palm oil and we no longer eat/buy anything with palm oil in it. I am looking forward to making these and telling them that these are our "new" bear paws! Thanks Dora! I really hope your kids like them - my kids love them, I need to make them again. And come up with a couple other flavours, because I really don't like buying them but they like them SO much! Let me know how they turn out! Yes! I will always and forever buy Oreos, that I have no issue with. I've tried the homemade version, they're good, but they're definitely not the same! And we have bear claws too, but yeah it's a pastry thing. Bear paws are cookies and I had no idea it was Canadian - I guess that's why I couldn't find a homemade version out there! I agree- I hate buying store bought cookies mostly because I love making them on my own and they taste so much better! These cake-like cookies look tasty! Really? I thought every kid loved those things - maybe it's a Canadian cookie? I don't know. They would love them though! :) Thanks Cyndi! These are so adorable! I love banana bread anything! I've seen the bear paw cookies in stores and have never tried them but these homemade ones are so much better! Never had bear paws before, but would love to try these :) Pinned! I am not a fan of cakey cookies either, but kids always love those things! I may have 3 boxes in my house right now... Lol. Definitely have to try these! Haha, yeah the kids love them! These were a hit though, so I think they were pretty close! Thanks Ashley! I've never heard of a bear paw but these are adorable. I love banana bread and am certain I would enjoy these! Gotta try them soon! You wouldn't have to bother with the shaping part then! But that's part of the appeal to the kids so I did it. They're ridiculously popular cookies marketed to kids (obviously!) that are really soft and cakey, with a bunch of flavours. I don't know if it's the shape or how soft they are, but my kids go nuts for them. Or maybe it's because I've never bought them so they only get them when someone brings them as a snack somewhere - always love stuff you never get and all that! :) Thanks Jen! Oh I love these Stacey! 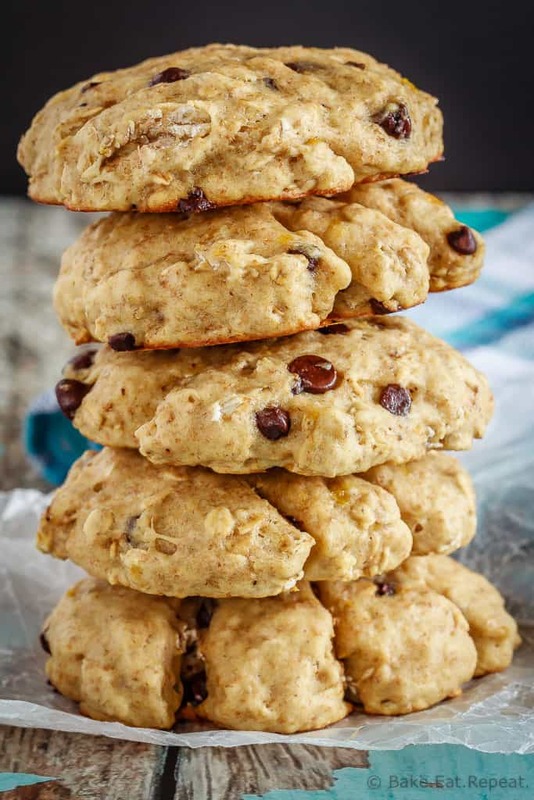 Banana bread is my absolute favorite, so I'm loving the idea of it in cookie form! And I love the name, too! Sounds so delicious. Pinned! Thanks Gayle! The kids loved these, my son was seriously SO excited when I made them a second time!